It is not unusual to see compatibility issues between two entirely different software products on a computer. I have seen this many times on my computers and I do not think it is easy to create any programs which do not cause any conflicts with other software tools installed. Anti Virus products are common conflict makers but in reality, we cannot assure any tool safe from issues. This tutorial explains different methods to find out the reasons for software conflicts and system crash on Windows computers and some tips to solve it. We discuss the clean boot and Windows Action Center warnings to find the product, which is responsible for the computer crash. We cannot always blame software conflicts as the reason for the recent system crash unless we prove it by a clean boot. It is the procedure to start your Windows computer with essential Microsoft services only. If your PC does not shows any system crash while in clean booting, it is one of the third party products you have installed on your PC is the reason for recent crashes. Now let us check how to clean boot a Windows Laptop. 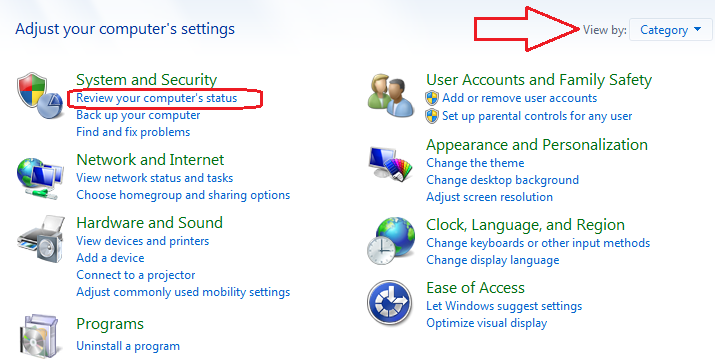 You can follow the same instructions for Windows XP, Vista, Windows 7 and Windows 8 PCs. Click Disable All Button and Click Apply. Check how your PC is working now. Are you seeing any computer failure or freezing? If not, it was one of the third party tools installed on your computer made all the troubles. We can find the real culprit by enabling suspecting third-party services at a time on System Configuration Utility and restart the computer. By repeating this process you can find the problem making software and take necessary actions to fix the issue. Here I check if Avast Anti Virus cause any system crash by enabling just Avast service and boot my PC. Avast is not affecting system performance and I decided to keep Avast active and continue the test by enabling another service with Avast service. This procedure may take time but it will find the software which causes software conflicts on your PC. If you have resolved the problem and no longer needs your computer runs in clean boot, you can disable it. Follow the steps until 4 and click Enable All button. Click apply and restart your computer to recover from clean booting. Now let us check the second method to find the real reason behind third-party application conflicts and system crash. Action Center warns all potential issues on your PC and by reading these warnings you can come to correct decision. To view the Action Center warning, follow the instructions below. Action Center warning is a good source to find out the programs that are not working properly on your Laptop. 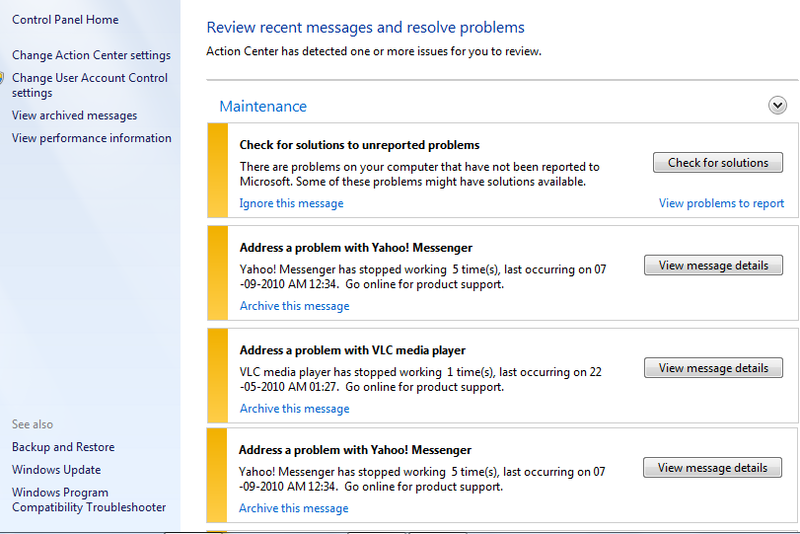 See how the action center gives proper information about malfunctioning of tools installed on your PC. Microsoft may have a solution for the issues you are facing. 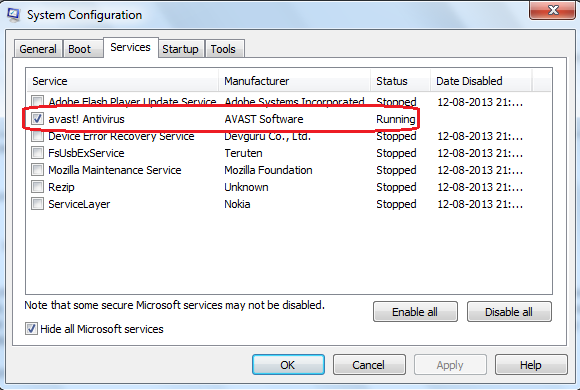 You can use check for solutions button to get help from Microsoft to fix Software conflicts issue. Out of these two methods, I prefer clean-boot procedure because there is a chance Windows has not reported the issues related to two conflicting programs installed. If Windows failed to find two conflicting applications installed and working, we cannot find any warning in the Action Center.